Located northeast of Presque Isle off Route 167, Quoggy Jo (sometimes spelled Quoggy Joe) is a small surface lift ski area. The roots of Quoggy Jo ski area likely date back to 1932, when the Quoggy Joe ski club started skiing in Aroostook State Park. A cable sled tow was in place by 1940. In 1959, Sel Hannah recommended a small ski development on Quoggy Joe Mountain, likely near or at the site of the cable sled tow. It is not known if this area was ever developed or redeveloped. Meanwhile, the Quoggy Joe Ski Club was registered as a Maine non-profit organization on December 27, 1957. That winter, the ski club relocated to the present day Quoggy Jo ski area off Fort Road in Presque Isle. Circa 1986, the local community and Kiwanis club helped construct a lodge at the ski area. 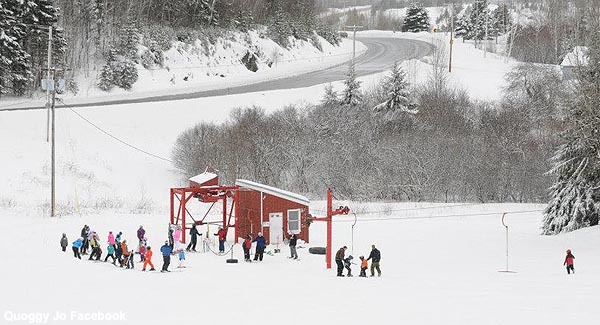 Circa 1999, the Maine Winter Sports Center, backed by grants from the Libra Foundation, signed a 99 year lease with the Quoggy Joe Ski Club to operate the ski area, as well as to use land for development of a nordic biathlon facility. In 2000, a used Hall T-Bar was installed at Quoggy Jo ski area, replacing the rope tow. The following summer, construction began on the nordic facilities. The Nordic Heritage Center was formally dedicated on November 24, 2002, giving Northern Maine a world class nordic biathlon facility. In 2006, the facility hosted the Biathlon World Junior Championships. 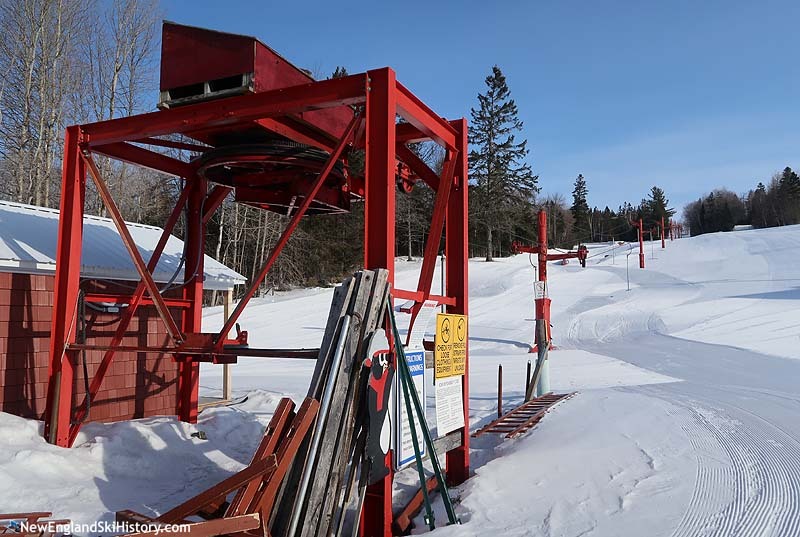 In June of 2013, Maine Winter Sports Center announced its intentions to exit the alpine ski business. Circa 2014, its 99 year lease with Quoggy Joe Ski Club was terminated, reverting control of the alpine ski area back to the club. The Nordic Heritage Center was transferred to Pineland Farms, held by the October Corporation, owned by the Libra Foundation. For the 2015-16 season, the Presque Isle Rotary Club helped to raise tens of thousands of dollars for lift maintenance and safety equipment. "I recall skiing at Quoggy Joe ski area in the late 1950's. I was 7 years old. It was the start of a long skiing life as I'm turning 66. I recall the rope cutting deep into the snow and trying to pull it up as a kid was tough. My friends and me always tried to b sure an adult was in front of us before we rode!"